Carol Feller is a knitwear designer and teacher who lives in Cork, Ireland. Carol, like many Irish children, learned to knit at a very young age. Carol spent many years knitting cardigans for her dolls and occasionally herself! There is a strong history of crafting in her family; Carol’s mother sewed much of her clothes, her grandmother was an expert knitter and her aunt ran a knitting shop in Dublin. Carol Feller trained initially as a textile artist and then as a structural engineer. While both of these backgrounds are very different the influences can be seen in her design work which is well-shaped, flattering to wear and enjoyable to knit. Carol strives to design clothing with a difference: not overly complex, but still giving a very unique end product. She likes to work with different construction methods, so long as they enhance the knitting experience and make for a more intuitively put-together knitted item. Carol enjoys teaching and helping other knitters improve their skills. Carol has travelled the world teaching in yarn shops and fibre festivals, including Knit Nation in London, Edinburgh Yarn Festival and Unwind. The classes she teaches cover a wide range of subjects from cables and chart reading, through garment shaping and customization right through to short rows and colorwork. In her classes you'll move from learning the basics to refining your knitting skills and fixing problems. Carol is looking forward to teaching on this knitting cruise and sharing her knowledge of Irish knitting and yarn with the group. Carol has been widely published in books and magazines; you'll find her work in Interweave Knits, The Knitter, Twist Collective, Brooklyn Tweed and Knitty to name just a few. 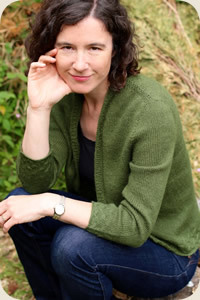 She has published 5 books; Contemporary Irish Knits, Short Row Knits, Scrumptious Knits, Among Stones, Dovestone Hills and Knitting with Rainbows. You can find all Carol Feller’s books, individual pattern pdf’s and even her own yarn line, Nua, on her website. As well as Carol Feller's books and teaching in-person classes Carol also teaches knitting classes online for Craftsy. These classes include, Celtic Cables, Essential Short Row Technique and Sweater Surgery. These classes can form a nice complement to in-person classes as you can use them to extend your knitting knowledge further.